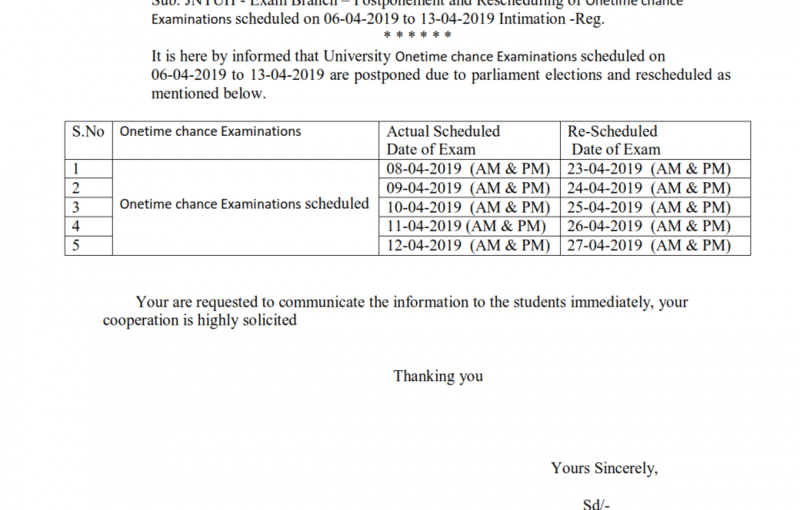 JNTUH Postponement and Rescheduling of Onetime chance Examinations scheduled on 06-04-2019 to 13-04-2019 Has Been Released By JNTUH University.Below We Have Provided The Direct Links To Download JNTUH Postponement and Rescheduling of Onetime chance Examinations scheduled on 06-04-2019 to 13-04-2019. Provided By The JNTUH Hyderabad University. JNTUH Postponement and Rescheduling of Onetime chance Examinations scheduled on 06-04-2019 to 13-04-2019. Don’t Forget To Share This JNTUH Postponement and Rescheduling of Onetime chance Examinations scheduled on 06-04-2019 to 13-04-2019..Among All Your Friends & Colleagues. Make Them Check Their JNTUH Postponement and Rescheduling of Onetime chance Examinations scheduled on 06-04-2019 to 13-04-2019.. Also Share This Info On Your Social Media Pages.